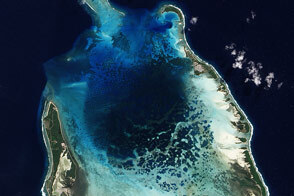 Arno Atoll, Republic of the Marshall Islands, is located to the east of Micronesia in the middle of the Pacific Ocean. The Marshall Islands are made only of coral reefs, similar to the adjacent countries such as Tuvalu and the Republic of Kiribati. 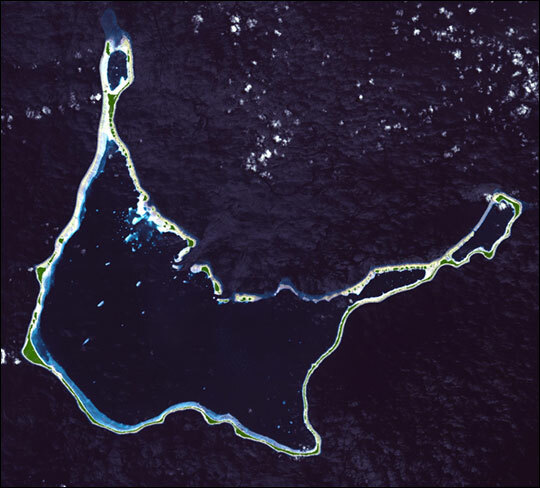 The islands consist of the Ratak Islands (sunrise in Marshallese), and the Ralik Islands (sunset in Marshallese). After almost four decades under United States administration as the easternmost part of the United Nations Trust Territory of the Pacific Islands, the Marshall Islands attained independence in 1986. 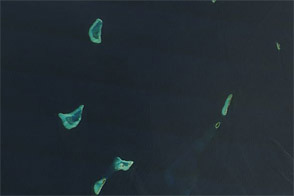 Arno Atoll is in the Ratak Islands, 20 km (12 miles) east of Majuro Atoll, where the capital is located. This image was acquired by the Advanced Spaceborne Thermal Emission and Reflection Radiometer (ASTER) on July 25, 2002. It is centered near 7.1° North, 171° East, and covers 41 by 45.3 km (25 by 28 miles).